Palace by the Sea is set on the TIP of the peninsula, RIGHT on shore of the Pacific Ocean, with incredible and UNOBSTRUCTED 180 degree views of Manzanillo Bay and the Pacific. Very private. It has 9,500 covered ft. plus extensive pool/Jacuzzi-deck and garden areas, including a secluded seashore palapa (shaded bench area) for romantic moments. This is our second home and we find great pride in the Palace, and receive great pleasure in having others enjoy our home. One of Mexico's most prestigious communities, La Punta is an ultra-exclusive residential paradise, coveted by notables the world over. Beautifully situated on a rugged peninsula that separates two majestic bays. Completely secure with 24-hour security and controlled access. • Three additional guest suites with vanities, full private baths, one has a bidet. Two have balconies with unobstructed ocean views and 2 double beds each, the other one sits in a lush garden and has a king bed plus queen. • First-class staff includes a great Mexican chef (everyone wants to take her home) who has been with us for 20 years. • Their only job is to make your stay as comfortable and relaxing as possible. • Work on your handicap at one or all of the World Class Golf courses in the area: Isla de Navidad, a spectacular 27 hole secret gem and El Tamarindo, laid out to take full advantage of stunning tropical jungle vistas, as well as Las Hadas and El Corazon. GETTING TO MANZANILLO - Nonstop from Los Angeles (Alaska Air, Aero Mexico), Mexico City; and in winter Phoenix (USAirways), Houston (United), direct to Manzanillo International Airport, which is a 30 minute drive to our villa. If you wish, plan to spend a day or two in Guadalajara and/or Mexico City on the way or returning - it'll break up the trip and make it more interesting. Many travel agents are not familiar with the nuances of getting to Manzanillo -- including feeder airlines. Therefore, feel free to discuss with us, as we may be able to provide helpful hints. RATES ARE FOR 6, 8 OR 10 PEOPLE, DEPENDING ON WEEK AND SEASON. EACH ADDITIONAL PERSON UP TO 10 OR 12 IS $385 MORE PER WEEK. WE HAVE NO CANCELLATION POLICY - IF WE RE-RENT THE WEEK YOU'LL GET THE MONEY BACK, IF NOT WE WORK SOMETHING OUT. About the owner: Frankie and I built our villa, use it, love it and it shows. She named it 'Palace by the Sea' when she first saw it completed, and the reasons will be obvious when you see it. Don’t expect merely “rental quality” décor. This is our second home; we use the finest, and are constantly improving the Palace. If you’d like to know more about Howie Alper, please google Alper Services, Chicago. One look says it all. We offer beauty, outstanding service, unparalled location, all amenities, convenience and security. Please read our guest testimonials and review the pictures of our spectacular spot which we are delighted to share with you. We love our La Punta Villa and your will too. We are the PREMIER villa - the ONLY 5-star home on La Punta. 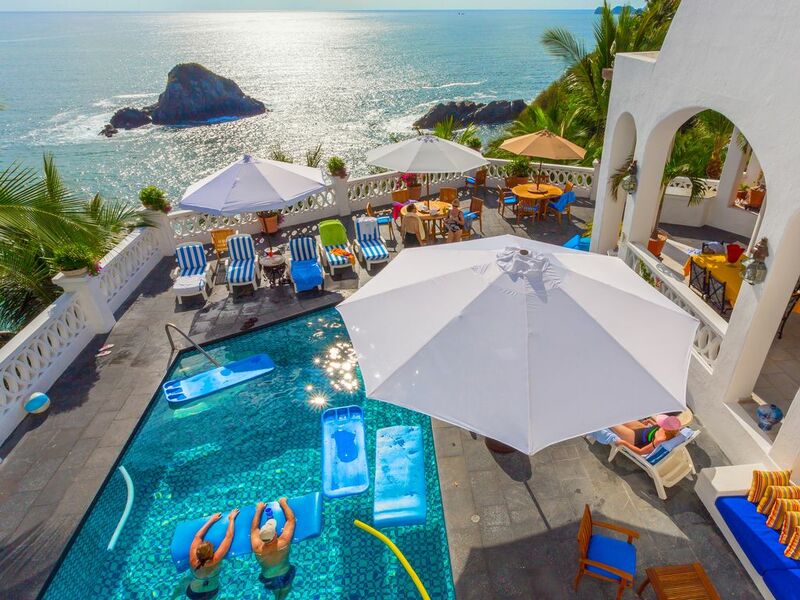 Palace by the Sea is set on the TIP of the peninsula, RIGHT on shore of the Pacific Ocean, with incredible and UNOBSTRUCTED 180 degree views of Manzanillo Bay and the Pacific. 9,500 covered ft. plus extensive pool/Jacuzzi-deck and garden areas, including a secluded seashore palapa (shaded bench area) for romantic moments. All amenities provided - Satellite TV, Surround Sound, Hi Speed Wifi, Free phone to US. & CA, Air-conditioned bedrooms, fantastic devoted staff including Pilar our incredible chef. Daily FREE laundry service. Large heated pool and jacuzzi. Exercise room, massage room and mini-spa. 4 private tennis courts and seclude private beach and beach club. Free use of our 9 passenger Ford Explorer and golf cart. One of Mexico's most prestigious communities, La Punta is an ultra-exclusive residential paradise, coveted by notables the world over. Beautifully situated on a rugged peninsula that separates two majestic bays. Completely secure with 24-hour security and controlled access. 180 degree views of Manzanillo Bay and the Pacific. Majestically set on tip of a peninsula right on Pacific Ocean with incredible and unobstructed 180 degree views of Manzanillo Bay and the Pacific. Whales and dolphins can be seen from our pool deck. Laundry is ironed and folded. * Media room includes phone, fax, high-speed internet access, library. In Media Room and living room/pool area. Ideal for weddings - room for several rows of chairs for all to witness the ceremony with the Pacific as backdrop. It's so hard to come back to reality after an amazing week at the Palace by the Sea. For Christmas, my husband and I took our family of three children and five grandchildren (and one on the way) to the palace for a week. It was the best present we ever gave to our family, and the best they ever received. Presents are forgotten but memories remain. The home is more than the pictures show, I know that's hard to believe because we dreamed over the pictures and video of the palace for months before we left. Upon arrival in Manzanillo airport, we were transferred to the Palace by a great group (HARO) and received a very warm welcome from all the staff with the best margaritas we ever had. The Palace staff is amazing, they are the most wonderfully warm and talented people. They could anticipate every want or need and would bend over backwards to assist in any way they could. Truly amazing people and amazing food. The meals were an event themselves. The best food we had in Manzanillo was at the Palace! The beach at La Punta was awesome, our group rented jet skiis through HARO that were brought to the beach, so convenient. Because there was so much to do and see and our group would want to go in different directions, we also had HARO assist with additional transportation (Luis was our go-to travel guide, he did an excellent job). We want to thank the Alpers for sharing their home with us, allowing us to build great memories of a wonderful time. In Dec I rented the Palace for a 8 nights for my husband's 50th Birthday, We had numerous friends joining us throughout our stay and everyone had the same the same response...AMAZING!! From the moment I reached out to the Alper's regarding renting the property until we said a tearful goodbye to the staff our experience was fantastic! The Palace itself is gorgeous (even more so than the photos), but what really made the stay perfect is the phenomenal staff! Every day we were met by smiling faces! Jose was there for every small or large request (there was a lot of liquor restocking :) Pilar is a wonderful Chef! She fulfilled our every request and surprised us with new dishes daily! One of our guests is a Celebrity Chef from New York and he could not get enough of her food- especially her mole and salsas. Paty and Carmen kept the house clean and were so helpful with any questions. I would also highly suggest you get a massage from Cecilia. She is a private massage therapist who comes to the house- there were 3 of us that got 2 massages during the stay!! And, finally a shout out to Albin who cleaned up our crazy messes around the pool after late night fun. I am a travel agent and will definitely be recommending Palace By The Sea to my clients. Hopefully, we will be back SOON!! Fantastic vacation at the Palace by the Sea! One of the very best vacations we've ever had! Four couples enjoyed golfing, shopping, swimming, ATV and horseback riding. The houseman was there to answer any questions and arrange all our activities. The chef… spectacular! The meals were beautiful and delicious . Our laundry was done daily so no need to pack lots of clothes, of course that left plenty of room in our suitcase for treasures to take home. We differently plan to vacation at the Palace by the Sea again! I have been delayed writing this review, but given the incredible stay I had at Palace by the Sea, I would be remised if I did not do a formal review before 2015 ends. Let me note that my husband and our two young daughter travel often and do at least two trips a year. I spent many weeks scouring the Internet to decide where we would spend our summer vacation in July 2015. We enjoy all types of trips including escorted land trips, cruises, railway journeys and even plan as we go adventures. This trip, however, I wanted to be relaxing and pampered. Often I return from vacation needing a vacation and this time I wanted true “lazy bliss”. I decided trying a fully staffed vacation home may be the perfect vacation for us. I stumbled across Palace by the Sea when I was searching vacation rental sites. From the first look at the palace I was smitten. Then I read the reviews and watched the video and I was sold. A gorgeous home with a chef preparing all of meals sounded like absolute paradise. I contacted the owners to reserve it and Mr. Alper responded immediately and even honored a lower price that the website quoted. I was impressed from the first contact. Because we have two young daughters (ages 7 and 11 at the time of the trip), I wanted to know about family activities. Mr. Alper put me in touch with his daughter in law, Sonja Alper, and the great service only continued. She was truly a God send and responded to EVERYONE of my NUMEROUS inquires. She made planning so easy and provided me with a lot of information to plan each thing we wanted to do. Once we arrived the palace was even better than the pictures and was truly spectacular. The staff was awesome and were there to greet us. I can’t say enough how much they helped make our trip wonderful. And the meals Pilar made (trust me I am a bit of a food snob) were phenomenal. Upon arrival we were made cocktails (mocktalis for the kids) and had an awesome dinner of authentic Mexican tacos as I requested. Pilar prepared all our meals and breakfast was always wonderful to wake up to the smells of eggs, bacon and tropical fruit. Pilar’s roast chicken and lobster tails were AMAZING. I was there on my birthday and she even made me a cake. The free wifi, house phone to make call back home, laundry service, golf cart and suburban and the amazing view all made for an A+ vacation. Our family had a wonderful and fun stay at the Palace!! The home it's self is very beautiful and the view is gorgeous. The staff was great and the food was outstanding. We will definitely make plans to go back next year!! There aren't too many things in life that can be called "perfect", but the week we spent at The Palace was just that...perfect! From the minute we arrived at this gorgeous location everything was just wonderful. The meals that Pilar prepared for us were the things dreams are made of - I'm STILL thinking about them. Jose and Patty took wonderful care of all our needs, including freshly laundered clothes each day. The Palace itself is beautiful - the living and dining rooms are outdoors so you don't miss any of the magnificent scenery. It was the most relaxing week I've ever enjoyed and have been telling everyone I know to try and get there for a vacation. The villa is 30 min from the Manzanillo Internation Airport. RATES ARE FOR 6, 8 OR 10 PEOPLE, DEPENDING ON WEEK AND SEASON. EACH ADDITIONAL PERSON UP TO 10 OR 12 IS $385 MORE PER WEEK. PLEASE INQUIRE. - Christmas, New Years, Easter, and Thanksgiving are premium weeks. - Discounts applicable for smaller groups and multi-week rentals. - Only ONE party will occupy the property at a time to assure privacy. - PURCHASES BANK: This "bank" is to fund your food, beverages, car gas and transport from/to the airport. When used we'll ask for additional funds (we don't mark anything up, you'll get an exact accounting) - AIRPORT TRANSPORT: We can arrange for a licensed car and driver to pick you up. We’ll send form to fill out. - FIRST DINNER/BREAKFAST: Please, advise us of any special food requests, also what you’d like for first dinner and breakfast. And let us know what kind of beverages you’d like to have at the house upon arrival. We’ll send form to fill out. - ENTRY AUTHORIZATION: Being a gated community, we need to follow La Punta security regulations. We’ll send La Punta Entry Form - Only ONE menu for each meal. - USE OF 2016 8-PASSENGER FORD EXPLORER: If the driver is over age 25 and licensed and responsible. You are responsible for car gas - GRATUITIES: $200 for chef, $150 each for houseman and house keeper; $100 each for the maid(s), gardener (and staff assistant) and house manager - NO SMOKING anywhere in the villa, inside bedrooms, or under the covered areas. Feel free to smoke on the grounds or patios. - PALACE INFORMATION: We'll send you important and helpful information - including Entry Authorization and Q+A forms - after first payment.